Our very own Elias Hancock (uOttawa/Nepean) was on the 7s development team on tour for the South American Rugby Sevens series. Please pass this along to your club members through all your social media methods. The key for this fundraising is to work on the fields and the women’s change room. TWIN ELM is doing a final fundraiser to get our fields and clubhouse in better shape. If you can donate any amount it will go a long way to building our sustainability. You will receive a tax receipt for your donation!!! You have until Feb. 2 to donate. Go to www.sport4ontario.ca, click on “Resources”, donate and we are project #115, sponsored by the Ospreys. Let’s keep TERP moving forward!!! 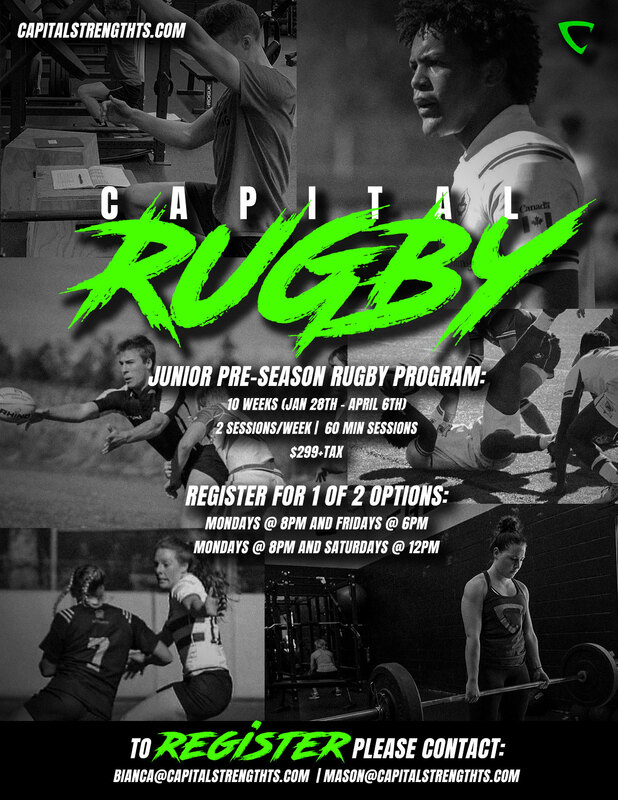 “Capital Strength Training Systems is starting a new 10 week preseason strength and conditioning program for junior level athletes. 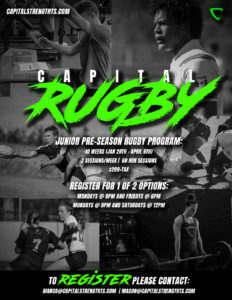 We invite all U15-U19 rugby players to join! Our high end sports performance facility is home to professional, national, and university level athletes, including NHL players, National team volleyball players, and USport Champion Rugby Players. See the image below for exact dates and price for the program! Leading these sessions will be strength coaches Mason Dingwall and Bianca Paiement. Mason is a current member of the Bytown Blues Senior Men’s RFC, a former EORU athlete, and a Queens Gael’s alumni. Bianca is a member of the Barrhaven Scottish RFC, and a University of Ottawa Gee-Gees alumni.